Since its inception in June 2004, the Fountain Pen Network has always been a refuge for the fountain pen lover, hobbyist, and collector. Over the years we have seen participation by pen businesses, retailers and providers of services, grow here, and we have also seen budding entrepreneurs grow up, quite often because of or thanks to this site. So, a big thanks to our wonderful pen community, which made this possible. An event like this also makes one stop, look back, and wonder about the future. We do think we need to incorparate and embrace the possibilities our entrepreneurs provide, and somehow balance that with the needs and wants of our hobbyist member community, while still providing the cosy warmth, friendliness and protective shield we have always offered here. We do think we have found this balance. A new forum for traders and entrepreneurs, who now finally have the opportunity to communicate and discuss their products and services in this community directly - a unique opportunity to showcase their products and services to a, let's be honest, a rather captive audience . This forum will be available for advertisements and announcements by paid subscriptions only. Adverts and product and/or service show cases will be restricted to Classifieds, the new forum, aptly called The Mall, and potentially some blogs here, depending on the account subscription selected. Rules for posting, specifically those for Classifieds and Market Watch, with new rules for The Mall, will be tightened a bit, but "normal" members won't see or feel the difference. Exisiting traders will notice the difference, but they will receive a lot in return for their contribution to the growth and continued existence of our Fountain Pen Network. We are in the process of making a few changes to FPN. Currently we have extensive discussions in the Moderator and Admin Team on the way forward for our great board. You will likely have seen some changes for the good already . Rather than a boring piece of text with links at the top of the board, there are now some brighly but tastefully coloured visual clues to the options we have in place to support this place. And over the past few days several options were improved or added as well . The FPN Pen Store is accessible now from the FPN Shopping Mall tab, with two options, or directly either from the link or from the pen picture in the header. The Ink ordering system now has its own link here, and it automatically creates an FPN Ink Ordering Email for you which lists all the essential information we require be able to process your order. The renewed and overhauled FPN Café Press Shop is clearly visible there too, and is also accessible from the FPN Shopping Mall Tab. Last but not least a set of support options through PayPal is available as well, allowing now not only for a single donation of your choice, but also for a yearly subscription with several choices if you so like. These options are available at the bottom of the page as well, but require scrolling down quite a bit. The new implementation makes these options visible on each page here on FPN, which makes it extremely easy to find them, we think. We are planning on adding more options to help with funding, and we will ask your input too. Therefore, keep your eyes peeled, and do check the latest News, the Recommended Reading Sidebar, and the Community Feedback forum on a regular basis. The reason for this new funding drive is simple: we need funds in order to keep this site going! And with the current increase in Member numbers, at a rate of 100-120 a day(! ), and which already stands at over 75,000, with about 2,500,000 posts in the forums, we will need a drastic increase in funding in order to service our community well. Essentially we are looking at a tripling of required funds, for the next step up in hosting (!). In short, any good ideas on how to achieve this are much appreciated! And keep on buying and donating, of course, it supports us all! Fpn Café Press Shop Totally Renewed And Overhauled! As by now we need new funding to keep our all-time favourite hang-out running, over the past couple of days we overhauled and renewed the old Café Press Shop we started back in 2005, and added some items which are more in line with this more modern age . We also changed navigation, and added all 3 ink logos as possibilities for several of the items too. The Café Press item profits go entirely to hosting for our site, so be generous, and do support us by donating or buying from our Café Press Shop. Items you will find there are buttons, stickers, stationery, mugs, caps, bags, sleeves, covers, cases and some pet products. If you require anything else, let us know, and we will add it to the collection. Of course, you'll want to know where to go for these goodies. Well, check the menu bar at the top of the page, underneath the header, and you will find that the FPN Store, next to the Blog and Downloads sections, automagically has changed to the FPN Shopping Mall, currently with two shops, namely our good old FPN Pen Store, and the all new dancing and singing FPN Café Press Shop! (check the forums frontpage, towards the top right). T-shirts and other leisure wear, and some home products like coasters, a cookie jar, wall clocks, etc. have been added to the shop. It's already a few months since we sold out all of our FPN LE Pens. Since we had quite a few requests for a few more, we checked with Stipula whether that was possible, maybe from a little spare stock material of the order we placed last year and some spare parts made at the time. It appeared that this was possible indeed, and as a result a few pens have been added to our store! These pens have been manufactured, are in stock, and are ready to be shipped, from Europe. Do note that out of necessity these pens are more expensive than the original batch, basically because it is a much smaller number that was produced. Furthermore, we won't be able to provide shipping as cheap as before either; we will ship at cost from Europe, however. There will be 2 shipping options available to you: one with and one without insurance. Do note that we won't cover losses or damages in transit if the uninsured option is selected. These are slightly different, in that the inscription contains the year 2012 rather than 2011, and a (sequential) number, but no size indication for the edition, which actually was 50 - it wasn't certain at production time how many could be made exactly. Another difference is the different nib sizes - the above were the ones we could get. Finally, to soften the new pricing a bit, all pens will have an additonal quality check and will have their nibs checked, adjusted if necessary, and smoothed by a nibmeister prior to being sent off, at no extra charge (a 20 euro value!). Furthermore, if you are interested in a nib modification or regrind, your pen will be dealt with immediately, if you so like, although this will be at additional cost. Those BB nibs of course lend themselves very well for an interesting modication if one so prefers . Do contact our FPN Pens Admin if you are interested in such a modification, see further down below. In order to check your orders and invoices, click on "Your Profile" (member id at top right of board), in the drop down list that will show click on "Client Area" (last option), and in the window that ensues, click on "Purchases" for an immediate overview of the details, or on "Invoices", and click on the invoice of choice again for the details. In case you have any further questions, please contact the admin team backchannel, either via email or by PM to the admin dealing with these pens, FPN Pens Admin. It has been several weeks already since shipping started, and many of the FPN LE Passportos in Chrome trim and in Gold Coloured trim have been collected by DHL in the beautiful town of Florence in Italy and have found their way to their respective new owners. For a few pictures of these pens, you can check here: http://www.fountainp...to-on-the-road/, or obviously in the FPN Pens forum. The Modello-Ts and Etrurias are expected to start shipping this week. A few useful, we hope, tips follow here, based on questions we received so far. 1. Removal/Exchange of Passaporto nibs. We've had a few questions regarding exchanging the nib units on the Passaportos, as those proved rather hard to remove, and we now have nib exchange / removal instructions which work very well, thanks to inkspot and Maja, who simultaneously and independently discovered the way to do this! The nib itself can be removed and replaced quite easily, all you need is something to increase your grip, like a piece of flexible rubber matting, and if you have a good grip with your fingers, it may even be possible to do this just with one's bare hands. I gave it a go with a thin, rubber, flexible mouse mat, and it worked like a charm! Essentially, the trick is to grip the sides of the nib, by the shoulders, with the rubber mat in my case, and just pull. You may have to wriggle a little, but the nib will come out quite easily that way, leaving the feed in place. I didn't have to wriggle, BTW, I could just pull it out quite easily in a straight line. Next pull the nib from the nib unit you'd like to install, and insert that nib by pushing it up over the feed, all the way as far as it will go, again using the rubber matting for increased grip (and to avoid ending up with a nib point in one's skin :D). Just check that it is seated properly, tight to the feed, and adjust if necessary. 2. Shipping info and tracking numbers. We send out emails with tracking numbers and a link to the DHL site in order to follow the shipping trail. Essentially, these emails contain a personalized note, with the tracking number for your order, and a url, and they are sent from info@fountainpennetwork.com, which is a no-reply email address created for exactly this type of message. If messages from FPN end up in your regular mailbox, these should too, but if they don't, better check your spam folder. The Passaporto F and M nibs tend to be a little on the narrow side compared to "regular" European nib sizes, more like Japanese nibs, maybe slightly bigger. Furthermore, as Etruria S.r.l. indicated when asked, there is some variation in nib width, as is the case with all nibs anyway. However, from all accounts they do write very, very smoothly, and quite impressively so based on comments received so far. Having said this, the 1.1 italic nibs are true to size, they really lay down a 1.1 mm wide vertical stroke. This is typical for all Stipula italic nibs: the line laid down is indeed as wide as it says in the descriptive nib name :D.
4. Initial starting problems / rinsing and priming a nib and feed. New pens, especially hand made ones like the Stipulas, may have some residual grease in the feed etc. when coming straight from the box, and as a result may start with difficulty initially. The best thing to do obviously is to remove any residu, and this can be done quite easily, by rinsing the nib and feed with a soapy solution. A soapy solution is essentially a smallish glass filled with some water and one to two drops of a neutral dishwashing liquid, stirred, not shaken :D. A neutral dishwashing liquid is one without additives like perfumes and skin softeners etc. Generally, the cheapest available will do very nicely. Rinsing the nib and feed can be done most easily when the pen is a piston filler, or in case of Passaporto or Modello-T, with a converter, international size. Just insert the converter in the pen, and in case of the Passaporto it doesn't matter that the size of the converter is too big to screw on the barrel, because we will not do that anyway. Next fill the pen through the nib with the soapy solution and squirt the solution out again, into the sink or into another glass. Repeat this a few (2-4) times, remove converter if appropriate, and dry the nid/feed/pen a little, with a soft cloth or tissue. Now fill the pen with a few drops of a simple ink, which flows well and has good lubrication characteristics. The amount roughly contained in a single short international cartridge is ample for this purpose. A simple ink as described, is f.e. Waterman Blue Black, Waterman Florida Blue, or Waterman South Seas Blue. I use such an ink to, what I have called several years ago, "priming the feed", i.e., somehow get the ink channels and feed itself thoroughly soaked in a good ink, thereby "priming" it to be used with any other, potentially more complex ink thereafter. The big advantage is that an ink as mentioned will make the initial writing process a pleasant one, whereas a complex, heavily saturated ink will potentially make this an arduous task. Complex inks often take several fills to prime a nib, and during that period one may experience a lot of skipping and slow or bad starting. Based on my own tests this proved to be anything from 2 to 15 cartridges full of ink (that is without rinsing the nib and feed as well). Priming a feed with a well behaved, simple ink avoids this, and sets the pen up for a more complex ink thereafter. 5. Increasing ink flow / making the nibs write wetter. The Passaporto nibs are medium wet writers, with rather tightly spaced tines, writing relatively thin lines as a result. Increasing ink flow is possible, but this needs to be done properly in order not to change nib geometry and potentially cause problems, like ink pooling. The best way to increase ink flow, is to use a brass feeler gauge, thickness 0.002 " or 0.05 mm. By lack of this, a piece of a thin transparant overhead sheet may be used as well. Just wriggle this between the nib tines and tipping, if need be by carefully pushing one of the tines down or up a tiny bit with a finger nail, and slowly but carefully pulling the feeler gauge or piece of sheeting between the tines and tipping ends, essentially carefully flossing the nib if you like. Repeat this process until ink flow is as expected. IOW between attempts you need to try if the result is satisfactory. If it appears that the feeler gauge is too thin to achieve the desired effect, you may want to try a 0.004 " or 0.10 mm gauge. In case you don't have or can't find a brass feeler gauge, you may try a stainless steel one, just be very careful, as stainless steel is much tougher and harder than brass, and may more easily damage nib tipping, or scratch the nib. If e.g., skipping cannot be fixed by rinsing the pen, or anything else for that matter, do report this to undersigned, by means of a PM, or preferably an email (check my profile to send an email), and we will try to answer as quickly as possible, and/or follow this up with Etruria S.r.l. where and if needed. So far this update, and a few tips. If you do have tips yourself, please do post them, they are always appreciated. The first shipments will leave the factory on Monday. Pens are currently being prepped for the courier service to come and collect them. Shipping will be done in the order of Passaporto only orders (next week), Modello-Ts with or without additional Passaportos the week thereafter, and any orders containing Etrurias thereafter again. This is the order of pen complexity, actually. Not all parts for the Etrurias have been received yet from the suppliers, but we have been promised all pens will be in the hands of our members before Christmas. As discussed with Stipula almost two weeks ago, we sent out a complete shipping list at the beginning of this week, and as usual it took more time than anticipated to prepare the list . We are updating this list on a regular basis, as and when we receive any address changes. The courier service to be used, will be DHL, worldwide. a) Change the address in Billing Info to reflect your shipping address for receiving your pen(s) in case of a move or pending move prior to receiving your pen(s). You can find Billing Info in the Client Area - click on "Your Profile" (your member id at the top right of the board), and from the dropdown list that opens, do click on "Client Area" (bottom most option in the list). This will result in a new screen, with a bunch of options on the left hand side, the bottom one of which is "Billing Info". Click on that, and you will get a screen with your current shipping address and other details, which can be changed there and then. Just don't forget to click the Save button. email for shipping address update: email option in Wim (wimg) profile. This to absolutely make sure that pens will get delivered to the correct address. It would be of tremendous help if you all could please check your postal addresses, just to make doubly sure. You can find those in the Client Area, under Billing Info. Here x stands for the individual serial number, and the number after the slash for the total number in that particular series (2 or 3 digits, depending on model and variant).Do note that this means there will be separate serial number sets of the Passaporto with Chrome trim, Passaporto with Gold trim, Modello-T with Azurite cabouchon, Modello-T with Mother-of-Pearl cabouchon, Etruria Notte di Luna with silver trim, Etruria Notte di Luna with vermeil trim, Etruria Notte di Stelle with silver trim, and Etruria Notte di Stelle with vermeil trim. Stipula will see what they can do with the specific pen number requests we have received, but this may not be possible, due to the fact that production runs for similar pens were filled up as much as possible, which may mean that pens have been produced in small batches here and there, and getting mixed up completely number wise for the different variants. Considering the pressure currently, with people working overtime and on Saturdays as well, it is just not feasible to select specific pen numbers, unless they come across one accidentally, and haven't prepared a shipping package for the person requesting that pen number yet. FPN has asked for all complete and working prototypes and production overrun pens to be sold through FPN as well, which means that there may be a few extra, but possibly unnumbered pens available once production has run its course completely. We will update the store as soon as we have definite numbers of each. As you can see, we now have only 3 (!) Etrurias left for sale. As a result, we are well past break-even point, which is really great, and we even make a little profit now for the upkeep of our site! Edit: corrected numbering scheme of Modello-Ts. The Fpn Pens Are Being Manufactured! 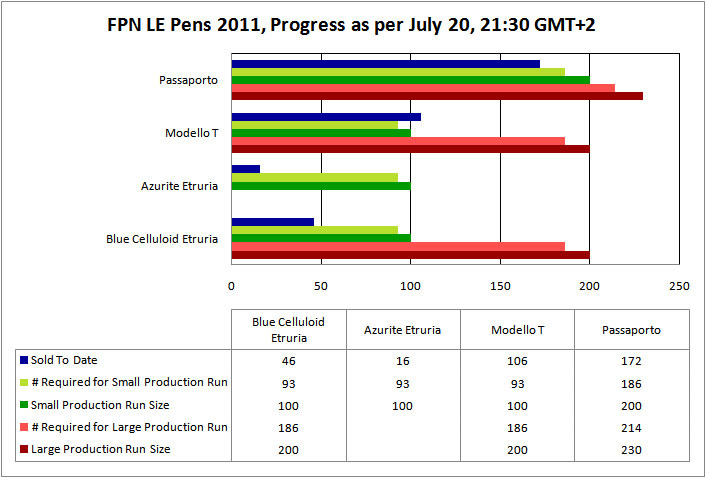 Production of the FPN LE pens has started, and shipping will commence on November 15 . The reason for the delay from November 1, to November 15, was a malfunctioning milling lathe, which cut production by 33 %. The FPN LE pens are the last production run allowing for so many different nibs. Stipula will standardize on just 3 nibs in 14K (F, M, 1.1 italic) and 3 nibs in 18K (F, M, 52 degree) from here onwards. This mostly because of the price of gold. This also means that anybody considering to order one or more extra 18K nibs, should really do that now, while stocks still last. Of many of the nibs besides the ones mentioned, stocks are running very low. So, if you still want any, better order those now. The Modello-Ts with Mother-of Pearl cabouchon (clip jewel) will be numbered separately as well, IOW, there will be two number ranges, one for those with an Azurite cabouchon, and one for those those with a Mother-of-Pearl cabouchon. Do note that this means there will be separate serial number sets of the Passaporto with Chrome trim, Passaporto with Gold trim, Modello-T with Azurite cabouchon, Modello-T with Mother-of-Pearl cabouchon, Etruria Notte di Luna with silver trim, Etruria Notte di Luna with vermeil trim, Etruria Notte di Stelle with silver trim, and Etruria Notte di Stelle with vermeil trim. We will send shipping info to Florence in the first week of November. This means that after the end of this month, any address changes effective after November 1, preferably from now on already, as far as they have not been logged already, should be communicated to us, to Wim (wimg) actually as coordinator of the FPN LE Pen sproject, either via PM or by email (use the email option in Wim (wimg) profile). This to absolutely make sure that pens will get delivered to the correct address. It would be of tremendous help if you all could please check your postal addresses, just to make doubly sure. You can find those in the Client Area, under Billing Info. 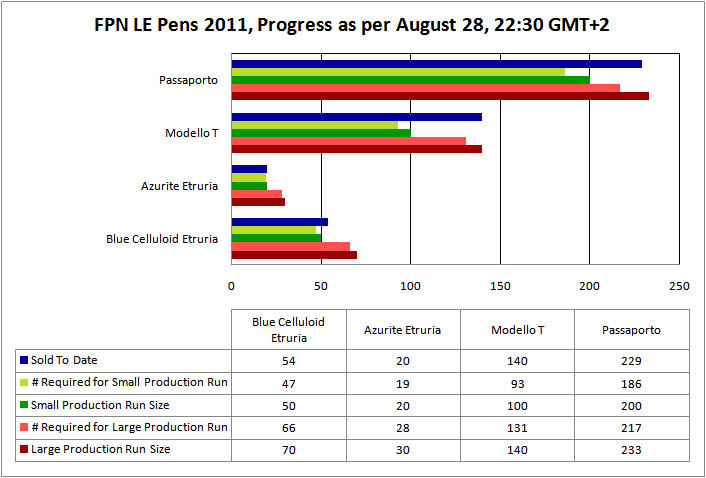 Stipula will see what they can do with the specific pen number requests, but this may not be possible, due to the fact that production runs for similar pens are filled up as much as possible, which may mean that pens are produced in small batches here and there, and getting mixed up completely number wise for the different variants. Considering the pressure currently, with people working overtime and on Saturdays as well, it is just not feasible to select specific pen numbers, unless they come across one accidentally, and haven't prepared a shipping package for the person requesting that pen number yet. FPN has asked for all prototypes to be sold through FPN as well, which means that there may be a few extra, but likely unnumbered pens available once shipping has run its course. We will update the store as soon as we have definite numbers of each. We are past break-even point, which is really great, and may even make a little profit now for the upkeep of our site! Passaportos and Modello-Ts have been sold out for a while already. Since we had quite a few requests for a few more, we checked with Stipula whether that was possible, maybe from a little spare stock material of the order we placed already. After a wait of several weeks we now have been told that this is indeed possible, and the additional few pens have been added to our store as a result. In case you can't find the nib of your choice in one of the models, please do contact us, as we may be able to provide a different nib, or exchange a nib with another one within the same model range. If you still want to be in on this incredible group deal for an incredible good price for a few incredibly good looking and working pens, don't hesitate, but be quick before these pens run out for ever. If necessary now even pawn, in addition to your street pavement, post box, garden shrubs, and tool shed with contents, also your watches and air conditioning equipment to get in on this once of a lifetime deal! Just check, and you will find that the prices you will pay here, are, to put it politely, more than competitive, and that's including shipping! Note that not only will you receive what is a great memento of your favourite site, in addition, you also support the good cause by investing in one or more of these pens, as a small percentage will go to the hosting and maintenance of your favourite site, the Fountain Pen Network! These pens will be manufactured for delivery early in November - this is an FPN group buy! In case you have any further questions, please contact the admin team backchannel, either via email or by PM. As mentioned in a previous column, sales of the FPN Pens have been brisk indeed, and as a result we have only few left for sale from our order with Stipula. Since our previous update, Passaportos have almost been sold out, Modello-Ts have been sold out completely, and a few more Etrurias have been sold as well. In short, if you want to be in on this incredible group deal for an incredible good price for a few incredibly good looking and working pens, don't hesitate, but be quick before these pens run out for ever. If necessary now even pawn, in addition to your street pavement, your post box, and garden shrubs also your tool shed and their contents to get in on this once of a lifetime deal! Just check, and you will find that the prices you will pay here, are, to put it politely, more than competitive, and that's including shipping! Do note that these pens will be manufactured for delivery early in November - this is an FPN group buy!. Last Sunday we prepared a complete list of all pens to be ordered, with a conservative estimate for any other pens we would be able to sell until such time that the pens would be manufactured. This conservative estimate was based on the number of pens sold, and the minimum quantity we needed to at least keep the prices as they were. This means that we have slightly increased numbers for Passaportos and Modello Ts, and stayed with the number of pens we already had calculated for the Etrurias in order for them to be manufactured. Stipula has been very helpful in all of this, and the contacts have been very pleasant indeed. On Monday morning we paid for the materials, and this means that we have been able to pin the production date. This means that the pens will all be manufactured by the end of October, for shipping in November . This week sales have been quite brisk, resulting in several of the pen/trim/nib combinations to be sold out already! We have now updated the FPN Store to reflect the actual number of pens available still, for additional pens as well. However, as only the total number of pens available were added for additional pens, rather than the individual pen/trim/nib combinations, we would advise everybody to please check which pens are available on page 1 before adding any to the shopping cart when going for combined shipping. We may have to disappoint you otherwise. As mentioned, several pen/trim/nib combinations have been sold out already. If you would like to make use of the opportunity to get a wonderful bespoke pen, unique to FPN, at a very good price indeed, and support FPN a little as well, make sure you are in on this deal before all pens are sold out! If you haven't done so, or need links to the polls, the Store, or the special forum to which those who order pens have access to, please check the previous installment of this column, FPN Pens: Hurry! Time is running out fast! Fpn Pens: Hurry! Time Is Running Out Fast! Since our previous column, a lot has happened. Stipula has been extremely friendly and helpful, and has decided to help us with our pens in a major way, for which we are extremely thankful. This means that although we cannot make up the numbers we originally agreed upon for our pricing here, they have decided to sell to us the lower numbers for the same price, regardless. This means we have a GO for all pen models and variants! Furthermore, we also have the pleasure to announce that the Passaporto Chrome version can now be supplied with a Medium (1.1 mm) Italic nib as well! All people who did order and pay for a Passaporto have been emailed, in order for them to be able to change to an italic nib if they prefer to do so. This option has also been added to the FPN Store. Furthermore, it now is also possible to buy an additional Passaporto nib, in either F, M or 1.1 Italic! These are easily interchangeable, as they can be screwed in and out. Again, additional Passaporto nibs have been added to our store . 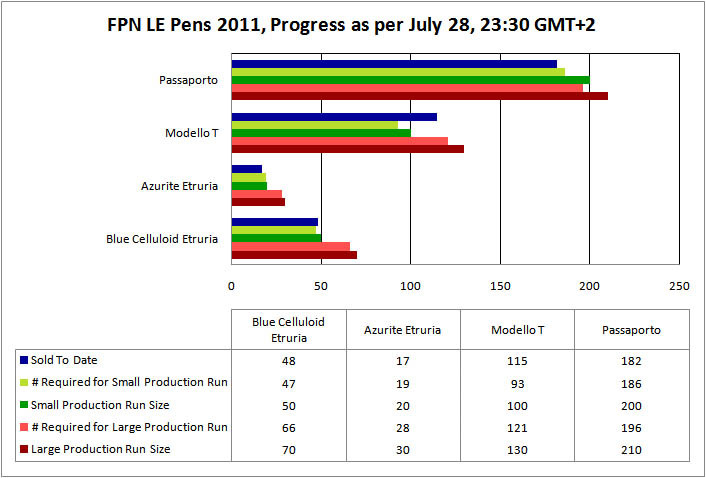 Because we wanted to order the FPN LE Pens from Stipula well before the Italian Summer break (which starts on August 8), in order to prevent too large a delay during the after holiday ramp up and run up towards the Christmas period, we will order our final numbers of the FPN LE Pens tomorrow, Friday, CET. This means that if you still want to have all options of nibs etc. on each pen model you'd like to buy, you better buy them quickly. We will order only very few extra, and those will be fitted with predetermined nib sizes. These we will decide on just before ordering. That also brings us to manfacturing, and delivery. Everything will be a little bit slower in the run up to Christmas, plus there is an additional delay due to the Summer Holiday, when the factory shuts down completely. This means that the pens will be manufactured by the end of October, hence with delivery in early November. The bars indicate where we stand currently as to pens ordered and paid for per model (navy bars), the numbers required for a small production run (light green), the sizes of small production runs (in green), the numbers required for large production runs (red), and the sizes of large production runs (red brown). These bars are also translated to a table, which shows what the actual numbers are in figures. In short, looking very good indeed! Effectively, we will be able to order the large production numbers, as we will have an additional 3 months to sell the remaining pens. However, considering the small numbers available after Friday, tomorrow IOW, this means you'd better hurry up if you would like to have this great FPN memento. In short, if you want to be in on this incredible group deal for an incredible good price for a few incredibly good looking and working pens, don't hesitate, but be quick before these pens run out for ever, and if necessary now even pawn, in addition to your street pavement, your post box and garden shrubs to get in on this once of a lifetime deal! Just check, and you will find that the prices you will pay here, are, to put it politely, more than competitive, and that's including shipping! In the previous column, we indicated we need to be at 93 % of pens paid for, for each manufacturing run, before we can realistically order all of the pens. Fortunately, emailing all members who had voted and had missed the announcements of the Store opening, did have quite an impact, and we would like to thank a certain ex-Admin, who wants to stay anonymous, for helping us out with this rather work intensive exercise! As you can all see, this depicts the situation better than the previous bar graphs in BB-code. Thanks to Opitzs for helping us in the right direction, BTW. The bars indicate where we stand currently as to pens ordered and paid for per model (navy bars), the numbers required for a small production run (light green), the sizes of small production runs (in green), the numbers required for large production runs (red), if applicable, and the sizes of large production runs (red brown), also if applicable. Before you get a fright, let us explain what these numbers mean in real life, and what we have discussed with Stipula early last week. First of all, production of Modello-Ts is a definite go, and it is looking well enough right now, that we can maintain current pricing! The Passaporto will also be a go. These great looking little pens keep on selling, and we are confident that we will have sold enough by the time these pens will be produced to create a full manufacturing run. So that is another go, and again, price will stay as is!. Oviously the models raising question marks are the two Etrurias. We have asked Stipula to have a look at possibilities for these, because we will likely order a total number of at least 70 Etrurias, and possibly up to 90, or more of you all are fast enough! Of course, we still want to produce both models. There are not too many sold of the Azurite version, but we have one thing in our favour, which is that these pens use the same barrel material as the Modello-Ts and the Passaportos. Hence, we could possibly ride along with those, from a material point of view. Furthermore, since the model is the same as the blue celluloid Etruria, from a manufacturing POV we could possibly ride the smaller number of pens along with the larger celluloid numbers. We were hoping to have had feedback by yesterday from Stipula on these ideas, but nothing yet so far, unfortunately. We do know that some of their employees are on vacation already, but we do hope to have an answer very soon. Any breaking news on these pens we will obviously share as soon as we are able to do so. In short, everything is still possible, and Modello T and Passaporto a certainty. The moment we come to an agreement with Stipula, which will definitely be before the end of the month, we will fix the final number of pens to be made, as barrel and cap materials will have to be ordered by Stipula to prevent too long delays - after the August summer break the Christmas production season starts, potentially causing very long delays if the materials aren't ordered well ahead of the summer holiday. In short, if you want to be in on this incredible group deal for an incredible good price for a few incredibly good looking and working pens, don't hesitate, but be quick before final numbers are established, and if necessary even pawn your street pavement to get in on this once of a lifetime deal! Just check, and you will find that the prices you will pay here, are, to put it politely, more than competitive, and that's including shipping! When the FPN Store was opened for the voters to pay for their pens, we had votes for 89 Azurite Etrurias, 157 Blue Celluloid Etrurias, 227 Modello Ts, and 215 Passaportos, a total of 688 pens. 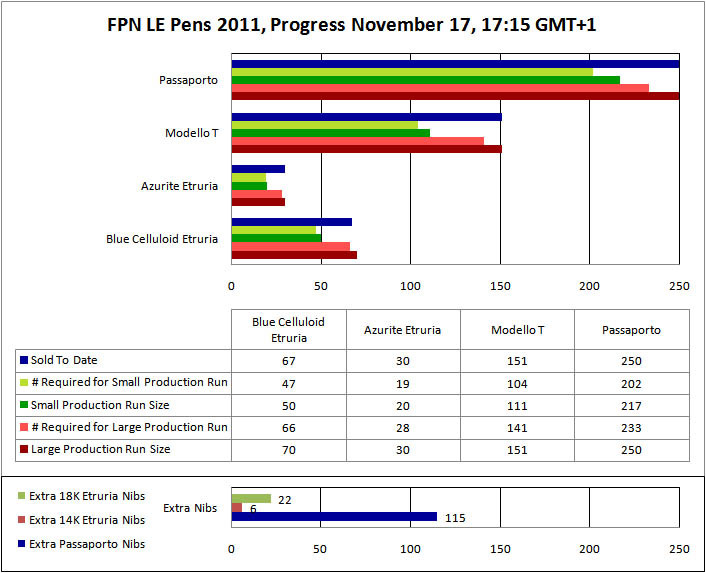 As 93 % is the cut-off point for ordering, we thought we could go as far as a total of 760 pens, namely 100 Azurite Etrurias, 200 Blue Celluloid Etrurias, 230 Modello Ts, and 230 Passaportos. 93 % of 760 is 707, or 19 pens more than voted for. We need to be at 93 % of pens paid for before we can realistically order all of these pens, which is what we were aiming for. Still a way to go IOW. 192 pens are paid for, of a possible 760. However, if need be we could lower these numbers, to a total of 500 pens, namely 100 Modello Ts, and 100 Blue Celluloid Etrurias, 200 Passaportos, and 100 Azurite Etrurias (the latter is the same number). This does mean we would have to ask a higher price for the Modello T and Etruria Blue Celluloid, as we would run at a loss otherwise. The cut-off percentages for these numbers are provided in the second, medium grey bar underneath each pen. IOW, we would like to urge those who voted, to please order and pay for your pens as quickly as possible. Do note that any hold up here will mean a hold up for everybody who ordered and paid for their pens. We would like to stress once more that this is a group buy, and everybody who voted, in principle committed to buying the pens voted for, as was clearly indicated in the polls. The pricing of these pens actually reflects the number of commitments given by means of these votes. We have therefore also decided to increase prices of these pens in another 10 days, the idea being that we wil be able to produce these pens at smaller runs this way if necessary. So, ordering and paying for the pens you voted for, will become more expensive in 10 days time. The starter discount, so to speak, will end. In the mean time we did get assistance from someone with a fair amount of spare time on hand, to start emailing all those who did not order their pens yet, as a reminder, especially with the upcoming price increase. Furthermore, for those who voted and those who did pay, we have opened a new forum, specifically for discussions and questions relating to these pens. We will set up a poll here for the final inscription of these pens as well. As the 10 day head start of the voters for the FPN LE Pens now has come to an end, we are pleased to announce that the FPN Store is open to all for ordering any of the FPN LE 2011 pens. The pricelist referred to in the latest update has been refreshed for the € / $ exchange rate of today (we'd like to receive payments in euros, to make things cheaper for you and us). For those who can't wait, here is the link to the store: FPN Store. The FPN Pen Store has been officially open for the voters now for a week already, so in short a good time for an update and further news . There have been quite a few questions on the content of the invoice email and the actual pen(s) ordered, which don't show on the PayPal or the Invoice emails. There actually is a way to check the complete invoice, as we discovered. When you click on "Your profile" (member id at the top right of the window), and have access to the FPN Store, in the drop down list shown you will see the option "Client Area" at the bottom of this drop down list. Clicking on "Client Area" will provide you with a new screen, with on the left hand side the options "Overview", "Purchases", "Invoices", "Support", "Alternate Contacts" and "Billing Information". These options allow you to manage any items you bought in the FPN Store at the different stages of the purchasing process. If you now click on "Invoices", you will see all invoices generated by you, with the text conform the Invoice email and PayPal statement you received. However, when you click on that text, you will get a new screen with the full text of the Invoice, including nib choices, etc., for every item on the invoice. It even allows you to print your (detailed) Invoice for future reference. Since all good news comes in threes, let's do threes here as well . 1. The uptake of the pens has been very good, we are now at a little over 26 % of voters who have ordered and paid for their pens, and we are at about 20 % of funds required for all pens. The latter is a little less than seemingly is voted for, because of type of pens ordered mostly, but not by much - the little extra is there to give peopel who missed the vote a chance to order pens as well. 2. As of this moment all registered voters have access to all pens in the store (and in 3 more days time all members will have access to all pens in the store ). 3. We had a long conversation with Stipula today, which proved very interesting and beneficial. Let us go into this below. Stipula indicated that it is possible for us to buy individual, additional nib units for the Etruria models, and this was the first part of the conversation. Great news for those who'd like to buy an extra nib fro their FPN LE Etrurias! Part two was that they also came with a very interesting proposition. Considering that in September their Christmas production runs start, the busiest part of the year by far, and they would like to help us deliver pens in a timely a fashion as possible to our members, they tried to think with us and lowered the entry point for us to start producing pens. This would give us not only a head start for pen production when enough funds are available, but it also means that the total number of pens can be produced in smaller batches, provided we pay in advance for the materials used. This would amount to approximately 25 % to 30 % of the total cost of the pens, and we are almost there now. It would also mean that Stipula can do the design of the pens the moment we pay for materials, so we wouldn't lose any time, due to resource constraints, if for any reason we can't buy pens fast enough to avoid the post-summer holiday Christmas manufacturing season! That is great news, because smaller production runs are apparently still possible within the busy season that way. In short: we could start delivery of pens much faster than the 60 day cycle normally required for the number of pens we are looking at. IOW, buy quickly - the sooner you do, the faster we all will have our pens! As we did receive quite a few questions on buying an extra nib by those who already bought an Etruria, we can now announce, that those who already paid for an FPN LE Etruria, can buy a nib as well (or more if they like), and associate it with a pen, without incurring double shipping costs, due to the association with these pens (automatic). Furthermore, any new invoices generated this way, are automatically linked to the original invoice in the system. Fpn Pen: Store Open To Voters! We would like to announce the opening of the FPN Store, right now, for ordering the FPN LE Pens, and first of course to those who voted in the polls or via mail and PM for the specific models of the FPN Pens they would like to order. Last week, before the crash, we received all information we needed from Stipula to set up the final parts of the store, and just before the crash we managed to write the code in order to make it possible to select all voters to get a head start with the purchasing/ordering process, as promised. On Tuesday we finished the testing of this code, and put it in place. Next we managed to change the currency setting from US $ to €, which is great, because when you all pay in Euros you save us and yourself 3 % in conversion fees! The changeover to Euros and putting all in place required us to temporarily open the FPN Store, and amazingly enough, two orders came in right away. Since the prices hadn't been adapted yet, we notified these enthousiastic members to please try again when the store would open for real, with the additional benefit that prices would be approximately 1/3 lower . We will also set up a new poll, for the actual text to be used for the FPN Pen inscription. There are quite a few options quite close in the ratings, and we would like to establish a single similar inscription to be used for all pens, before the order is sent off to Stipula. We will set this vote up so that only those who voted so far will have access to this vote, that seems fairest to us. We also created a new price list, corrected for the latest info. What we didn't realize when we started, is the amount of the transactional fees we would have to pay. We have included those partly in the price, and lowered our expectations for funding at least to some degree, so we all share those fees. It does mean that the pricing will be slightly higher than we first anticipated. Do note that the $ price is an indication only, it is based currently on the Wednesday, June 5, exchange rate (updated!). The euro pricing is the only correct and up-to-date pricing! The list opens in a new tab or window, BTW. Finally, time required to actually manufacture this pen. Stipula indicated that due to the large number of pens we are dealing with here (500-600+), the expected delivery time from down payment for the order until final shipment is in the order of 60 days. This not only because it is such a large order, but also because in August they will be closed for two weeks. In short, if payments come in fast enough, we may be able to receive our pens before the holiday deadline, if not, it will likely only be end of August / beginning of September. So, where is the store, you may ask? Well, you can find it here: FPN Store, or as usual, in the tabs underneath the header, between the Downloads and Members tabs. - Voters have a 10 day headstart on ordering and paying for those models they voted for. - In 10 days time we will open the FPN Store to all, with all pens open to order and pay for by all members. - Payment is set up to be in Euros by default, because we have to pay for the pens in Euros. - Payments will be approved manually, so there may be a delay between you paying and receiving confirmation. This is due to the PayPal setup we have, which cannot be altered right now. - If you insist on paying in US $, please add 3% to the total amount, due to conversion fees we will incur. If you don't, we will not accept the payment. - If a pen is sold out, and we haven't asked Stipula to manufacture any pens yet, contact us backchannel, and we will see what we can do for you. - VAT will be calculated automatically, based on your residential location (EU legal requirement for e-selling). - Shipment costs will be calculated automatically too, with VAT added if applicable, and is € 10.49 for USA, Canada and EU countries, and € 20.99 for all other countries, excluding VAT - this is at cost. Anyway, you can now finally go ahead and order your pens. As mentioned in the previous news update, we still had a few snags to deal with. At the end of last week, we had had extensive contact with Stipula, and we knew the representatives, we are dealing with, would be traveling to the US on Friday, now more than a week ago, to attend an exhibition and to have meetings with their US representatives. Expected return date was Thursday, but it currently looks like that was Thursday after close of business in the US, as we haven't heard anything from Stipula since their departure, yet. We are therefore still waiting for new pricing considering our proposals, and the possibilities we agreed upon. Let us first reiterate what those are. In short, plenty of choice, 2 material types, 3 rhodinated nib types, 7 duotone nib types, silver or vermeil trim, but at different price points. To return to the snags, those have been mostly solved. As indicated, shipping to US, Canada and EU countries would be € 10, and we now have managed to realize a € 20 shipping fee to all other countries in the world, with in both cases no extra fees for combined shipping! The VAT issues we discussed have also been solved completely. VAT will only be charged, as we have to do from a legal POV, on a EU country by country basis, but will not be included in an overall price, IOW, the non-EU prices will be tax-free (VAT-free)! Stipula did ask us a last question with regard to the pen mix in the production runs, and this is likely causing the current delay, because by the time we could reply, they were well underway to the US. In the mean time we did set up the FPN web store, which isn't visible yet . We are planning on giving the voters first dibs at ordering, for up to 10 days, after which we will open the store to everybody. The reason for this is that we do have only limited production runs, and as the voters in principle have committed themselves, they will therefore have the option to buy first. So if you want to have first dibs too, make sure you vote before the polls close, with closure scheduled for very early on Tuesday, May 24! It has been some time since an update, so we thought it would be time to do so. Let us go through the options remaining one-by-one, with an indication what to expect. We currently have reached a total of 200 Passaportos, if we add Chrome and Gold Coloured trim together. Based on our discussions with Stipula, considering a split of approximately 150 Chrome ones and 50 Gold coloured ones, we should be able to get both produced. For the Gold coloured ones that would mean no nib selection possible however, only an M nib will be available. For the Chrome version there will be the option of an F or an M nib. Gold and/or titanium nibs will unfortunately not be available, as we would need at least 100 votes for each, which we don't even get close to. Even so, it would still mean both pen options will be produced. Here too the total is approximately 200 pens. Considering the votes, a gold coloured option is not in the cards, and neither is a gold nib. Also, palladium section ends (close to the nib) would make it extra expensive considering the relatively small numbers, so we do think that an azurite section from barrel threads to nib end is the way to go. However, we will have the option to select the clip jewel as we'd want to, and the nice thing is that that won't add to the cost. Currently there are about 65 MOP clip jewel choices, and about 135 azurite ones. Therefore, also two models. Here it gets a little more complicated. It looks like we can and will do both the cellulose acetate version, and the azurite version. Considering the overwhelming majority for PF systems, they would be made as piston fillers. We did ask whether it is possible to have a choice of nibs on any model between the 14K rhodinated ones and the 18K duotone ones, but we haven't received a clear answer yet. Furthermore, we have learnt that maybe, on a select few, it would indeed be possible to use vermeil trim rather than silver trim, but here things are not 100% clear either. IOW, we will certainly produce both an azurite, and a blue cellulose acetate version, and both in silver trim and 14K rhodinated nibs, just that we don't know yet if other choices are available too, for nibs and trim. Next there are two important issues still remaining, and that is how we handle shipping and VAT etc. Shipping appears rather expensive outside of the USA (€ 10) and the EU (€ 10), namely € 35 for any country except USA and EU. We are therefore still looking at shipping alternatives.VAT is another problem because we are not a registered company in Europe. This could possibly mean that VAT will be levied on all pens, at the Italian VAT rate of 20 %. We are also checking if this somehow can be prevented or handled differently. Until we are sure about the solutions for VAT and Shipping, we will not be able to complete our web store yet, and the same really is true for the Etruria voters. We have agreed with Stipula to try and resolve all outstanding question by means of a telephone conversation if we can't move quickly enough with our current email exchange. However, this will not (yet) solve any VAT or shipping issues. As mentioned, we do hope to resolve the remaining questions and issues next week, hopefully early next week, so we can finally go ahead with the ordering process, on our soon to be FPN Store.